San Antonio Express-News cherry-picks salary data. A recent story in the San Antonio Express-News trumpeted this astounding figure: the pay for senior executives at CPS Energy has jumped by 58 percent since 2010. A wider look at the data, however, tells a more nuanced story. Executive pay has increased since 2010, because in fiscal 2009, executives did not meet performance goals and so didn’t earn incentive pay. The following two years, two of the strongest in the company’s history, those goals were met, and bonuses, which account for almost one-third of executive salaries, were paid out. Looking at salaries from 2008 to 2012, then, senior executives saw their pay increase by 4.5 percent. That’s compared to a 19 percent increase in non-executive salaries over the same period. This chart, published in the San Antonio Express-News, shows CPS Energy compensation over the last five years. While 4.5 percent is far less dramatic, and doesn’t make for nearly as shocking of a headline, it’s still important to understand how compensation is structured at San Antonio’s municipally owned utility, and why bonuses were paid the past two years. For the second year in a row, CPS Energy’s electric reliability is within the top tier of the industry, its employees have increased safety to a record high, and customer satisfaction remains high. That’s what the San Antonio City Council heard at an April work session from CPS Energy CEO Doyle Beneby, who also offered an update on the state of the energy industry and the city-owned utility’s overall strategic plan. CPS Energy is recognized as having the premier credit rating in the industry by Bank of America/Merrill Lynch, a position bolstered by a continued focus on cost efficiency and process improvements within the company. As a result, operations and maintenance costs per CPS Energy customer continue to drop, from $368 to $345 per person, with a goal of $333 per person by 2015. At the same time, employees continue to work more efficiently. That has resulted in a leaner workforce, from a high of almost 4,300 in 2001 to about 3,400 today. Meanwhile, capital costs decreased from fiscal year 2012, while operations and maintenance holds steady for the next two fiscal years. Because of that, the budget for 2013 did not include a rate increase. Rates for CPS Energy customers remain some of the lowest in Texas, and the lowest among the largest 20 cities in the country. Then there’s CPS Energy’s stepped up commitment to local economic development. The utility’s New Energy Economy partners, including OCI Solar Power, GreenStar, Silver Spring Network and Consert, among others, have made $88 million in investments in the San Antonio region to date, including the creation of 154 jobs and $1.5 million that has been donated to local educational initiatives. Those partners are on track to meet their commitments to create more than 1,000 jobs by 2018, with investments topping $974 million. 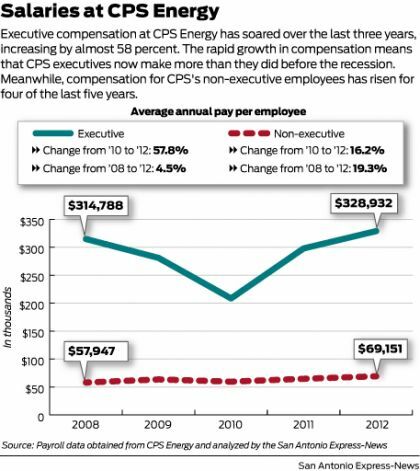 For all these reasons, CPS Energy employees earned incentive pay the past two years. The utility has had an incentive program in place for 13 years now, to encourage top performance for safety, budget management, low bills, customer satisfaction and care for the environment. Instead of giving higher base salaries, CPS Energy prefers to have lower base salaries, encouraging strong performance with the opportunity to earn more by meeting company-wide goals. Those bonuses don’t boost salaries beyond the market rate, however. CPS Energy employees’ salaries are regularly compared to salaries for similar utilities across the region and nation. A recent study found that including bonuses and benefits, top executives are paid somewhat less than the industry standard for similarly-sized energy companies, while most employees are paid within range of competitive market rates. Employees do not always meet their annual goals. In fiscal year 2009, only non-executive employees met and were paid for meeting the company’s safety goal that year. Executives didn’t receive incentive pay at all – hence the dip in their salaries, making the increase of the following two years more dramatic. This year, executives earned a 32 percent bonus; more of their pay is at risk, notes Lewis, because they have the most responsibility for meeting annual performance goals. Most employees have between 25 percent and 7 percent of their salary at risk. One group of hourly employees has chosen, as part of their working agreement with CPS Energy, to have just one percent of their pay at risk. Taken together, this year’s bonuses totaled $16.2 million, or 6 percent of CPS Energy’s total labor budget. It is reasonable for the community to debate whether those bonuses are fair, said Lewis, and she noted that there are different ways to structure compensation. Some utilities simply guarantee a higher base salary, for example, while others only offer incentive pay to top executives. Gotta love how the non-executive salaries were double, but now triple the average San Antonians yearly salary. As I suspected, and you’ve confirmed, this is the real problem…I know too many CPS employees that have six-figure salaries due to nothing more than time-in-service, yet their jobs became progressively easier with technological advancements. It’s for this reason that many have told me I should get a job at CPS. By the way, those giant transmission lines along Hwy 151 that were claimed to be for providing power to the growing residential developments on the northwest side never made it, they stopped at a certain government agency’s new facility. CPS…lies, lies, and more lies.